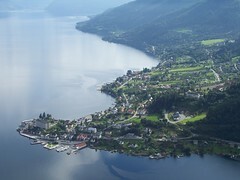 “Visit the other side of the fjord!” proclaimed the sign outside Balestrand Tourist Information Office, before proceeding to inform those excited enough to be reading, a list of bus times to Dragsvik – cunningly the small town on the other side of the fjord. With such exciting options, it’s no surprise that Balestrand Tourist Information Office was promoting Dragsvik heavily. 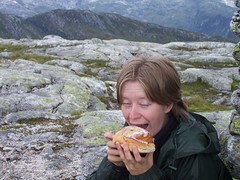 Still, with no other ideas of what to do, I suggested to Catherine that we might try the hiking trail. So whilst I popped into the Coop Marken supermarket for some supplies, Catherine popped into the tourist information office to find out more. So at 1005 we got on the bus. Well I say bus cos Fjord 1 Sognbillag had provided a rather nice luxury coach for us to travel on. Thankfully our boots were not yet muddy so we didn’t feel particularly bad about walking on board such wonderful travel, as we dutifully paid out 24 NOK each (about £2). Twenty minutes later and we were in Dragsvik and heading off up to the path. There’s a sign at the bottom of the path although to be honest, I can never be bothered to read such things so stood around admiring the view instead but it transpired that the walk went up some hill sort of thing called Tjuatoten – a simple case of following the red blazes. 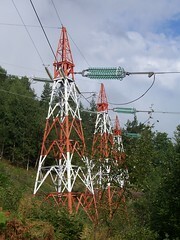 Before long we were going upwards along a forest trail, with the occassional glimpse of pylons and their cables – the electric cables strung across the fjords seemed to connect up via the hill. 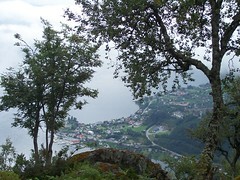 After a gentle stroll, we reached Orraleiken – about 400 metres above sea level – and home of more pylons and a good view of Balestrand on the other side of the fjord. Well should have been if it hadn’t been for the fact that the place was completely surrounded by cloud! Cloud was to be a feature of the walk for some time – clinging to the hillside we barely got any views other than the trees around us. Thankfully it was not to last for long and at a rest point further up the hill, the cloud parted just long enough for us to see an amazing view of the area below. From thereon, it was a tough scramble – literally requiring us to grab hold of rocks and trees in order to get up. It wasn’t until we’d got out of the trees until we’d realised what quite an undertaking we’d started. Down below we could see the clouds hugging the side of Orraleiken. During a quick rest we saw a never ending succession of clouds arriving, rising up, going down and back on their way across the fjord. And yet the summit still seemed so far away. So far that at one point I have to confess that I was contemplating giving up and just collapsing on a rock. Still we persevered, and just after 2pm we finally got there. It was at that point that we found out just why it was such a hard slog. 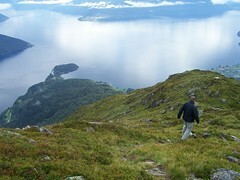 We’d walked, scrambled and almost crawled a whopping 1098 metres above sea level. No wonder I was so tired. This was no simple walk up a hill. This was the pair of us climbing a mountain! We’d gone up higher than Snowdon! As I collapsed on a rock near the conveniently placed cairn, Catherine took a photograph of two spritley German ex-pats, who had moved to Florida in the 1960s. They were the only other people we’d seen as we occasionally passed them, or they passed us. Naturally they reciprocated the favour. After a good admire of the exhilarating view, they opted to head down a different way – wandering off over the tops to goodness knows where. There was no marked trail going anywhere other than where we’d come from, but presumably they found there way back. We on the other hand began to assemble some food, tearing into bread rolls and piling on sliced cheese, before tucking into the piece-de-resistance – a big sticky bun. With energy levels restored, it was time to head off back down where we came. Going down was naturally easier, but the steepness of it made it slow progress – if not a little perturbing to see how far down we had to go. 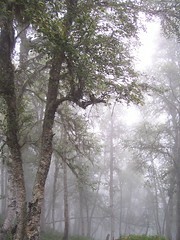 It was two hours later before we made it back to Orraleiken – still a mere 400 metres above sea level. 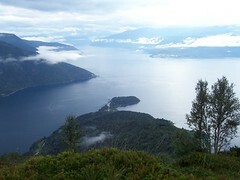 Thankfully at this point the clouds had disappeared, and settling down on the pylon base we got a stunning view of the Balestrand area. It was about 5pm when we finally hit the main road, and thankfully not too long before the bus was due, having spent around six and a half hours on something which we’d initially thought was just going to be a couple of hours stroll. Our climbing extravaganza was then followed by a puzzle. The stop we got on at was several minutes closer to Balestrand than the one we’d alighted from in the morning, yet despite this, we were rather strangely charged 25 NOK each – a whopping 1 NOK extra each for going less of a distance. 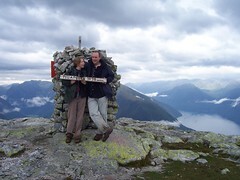 Quite why, we never worked out, but being too tired to ask, we plonked our muddy feet on the floor and let ourselves be driven to Balestrand. We got back, tired and in need of a kip which was why we went back to the hotel after buying some chocolate muffins. After all that exercise, more substantial food was of course required, and that in itself offered a little puzzle. Whilst I was presented with a lovely fish soup followed by baked haddock and boiled potatoes, my dear vegetarian partner got vegetable soup followed by some rather strange rice, leek, cauliflower bake thing which was, it has to be said, “interesting”. Desert was similarly bemusing – something which appeared to be a moosey crème brulée slice. Still food is food. And sometimes you need it.